Caused by a deficiency in calcium/magnesium; just as the first flower buds appear, soak the soil around each plant with a mild Epsom salt solution. You can also, a month or two before transplanting, bury some crushed egg shells in the tomato bed. Tomatoes – Earlier Ripening – Remove suckers early…these are the short growths in the angle between the main stem and a main branch. Tomato transplants – after the soil is warmed, transplant the tomato plants deeper, to just below the first set of genuine leaves. Roots will form along the main stem, making for a stronger, healthier plant. Tomato plant watering – even when mulched, the soil will dry quickly under the hot summer sun. Here’s a way to deliver water directly to the root zone. / Buy some golf club tubes (used to protect the grips) – the softer plastic ones will last longer than hard plastic. Punch a couple of holes around the circumference, 3-4 inches from the bottom. Then bury the tube ~8 inches down, near the plant. (The tube will probably need support.) / Every day or two, fill the tube to the top with water, once or more. Water should percolate/spread to where it’s needed most. If like me you plant plants in raised beds closer together than prescribed, you can space, e.g., two tubes for 3 plants. 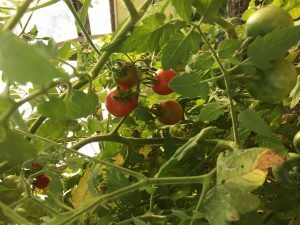 Tomato ripening (on the vine) – as fall approaches, there will be tomatoes that are full-sized but still green; to speed up ripening when you can still maintain some flavor, cut back on watering…the plants will send their energy into the ripening process. Also pick off any flowers and even tiny tomatoes. Optimize sunlight – buy some white Styrofoam panels (used for home insulation projects); support them on the north side, at an angle near the plants (taller-growing types), and/or line the soil underneath each plant. The reflected light enhances the growing process. When the first flower buds appear (usually the male flowers), cut a strip of nylon sock/stocking about 2” wide by 10” long; wrap (completely cover) the plant stem from slightly below the dirt surface to several inches above; the bug gets confused and will not lay her eggs on the lower stem. Grow several Royal Burgundy bean plants among your green beans (including pole beans); the purple bean plants repel the beetle (all my plantings are in beds, not rows). Beans turn green when cooked. Interplant other vine plants, like winter squash and melons; the mix of leaves may confuse the cuke beetle and they will leave your cuke plants alone. Take the cardboard inside of a used-up toilet paper roll, and cut in thirds; surround the stems of very young plants starting at an inch below the dirt surface. Cover tilled bed with clear plastic and secure (available in rolls from Home Depot, etc. ); sun’s rays will penetrate and warm the soil, and weed seeds may sprout so the weeds can be removed just before planting/transplanting the bed. Start seedlings of summer squash in pots; plant where lettuce and peas have finished providing (keep records for squash planting, to time the transplanting correctly). I plant my seeds June 1st. I bury the pots in soil to slow drying out (be observant). Also can plant carrot seeds in these beds..they should fully mature (I pick them just as the ground begins to freeze). Slug Control – While Orhto’s Bug Geta works, it’s more fun to: load (and label!) a spray bottle with 50/50 water and household ammonia – will not harm plants; go on ‘slug patrol’ with a flashlight, spraying those slimers as you go…and watch them shrivel up. (I’ve seen at least 6 different kinds.) And the nitrogen is a good garden thing! Bird Damage – Suspend unwanted CD’s on a string at appropriate height; flash will scare birds away. Second crops – it works for me to plant carrot seeds when/where the lettuce is finished. And summer squash in the radish, pea or broccoli beds (I start the squash seeds in quart-sized or larger containers – keep watered! – around the first week in June, and transplant when it’s time). Also start a late crop of cabbage in containers around the first week in July. By late August/early September, there is usually a ‘tired’ plant or two that can be pulled, opening up planting areas for the cabbage.